Once confined to just the plains, this solitary canine is now found throughout the United States. Coyotes have learned to live with man by being active when man is not (when it's dark) and their presence may be more of a concern to pet and livestock owners. Since coyotes diet consists mostly of small animals and rodents, they could help your garden more than hurt it, but they can do their share of damage in the garden as well. Coyotes bear young in spring. At that time, they are particularly active and aggressive while looking for food and protecting their young. They aren't picky eaters. In addition to small animals, they eat fruits such as pears, and vegetables such as melons. Look for tooth marks and dog-like tracks to determine if Wile E. Coyote has been visiting your garden. If you're concerned about coyotes in the neighborhood, cut down weedy areas and tall grass areas where their main food (small rodents) live and where coyotes can hide. Secure garbage can lids and remove pet dishes at night. Cover vegetables at night and pick up windfall fruits, or use fencing to exclude coyotes from the garden. 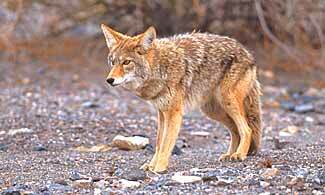 Coyotes are not easy to scare off, but may be frightened by large guard dogs, bright lights, or sounds.